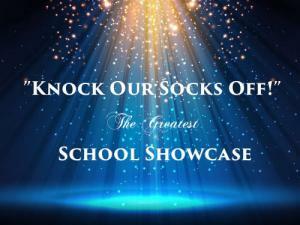 PALM BEACH, FLORIDA, UNITED STATES, November 6, 2018 /EINPresswire.com/ -- On Monday, December 17, 2018, Giving Partners Bombas and EW Foundation will come together for the “KNOCK OUR SOCKS OFF!” SCHOOL SHOWCASE at the Rinker Playhouse, Kravis Center for the Performing Arts located in West Palm Beach at 7 pm. 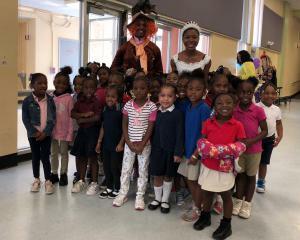 During the showcase, students from participating Palm Beach County Title I schools, will showcase the award-winning books: Sip Tea with Mad Hatter grades K-2 and Tame Your Manners grades 3-5. The children will share funny, clever and compelling answers from different animals, beloved characters in the book to demonstrate learned character traits, social skills and core values. The top three school winners will be awarded with incredible donations of new books from the EW Foundation and 1,500 pairs of new socks from Bombas. strengths necessary for academic success. imaginations”, stated Kelly Cobb, VP Community & Giving. In preparation for the Showcase, Principals, reading coaches and teachers from five Title I schools in Palm Beach County are currently working together with their student bodies to conduct competitions and select the top winners from each class grade (K-5) to compete in the showcase. The top six (6) winners from each school will be announced early November. The showcase will also include musical delights from EWF ambassadors, the Dreyfoos School of the Arts and Palm Beach Symphony. An esteemed panel of judges for the showcase is comprised of community leaders, school board members and EW Foundation representatives. Over the past 5 years, EWF has visited over thirty-three (33) schools to provide interactive story times and signed books to over 17,000 students. The award-winning educational books were written by author and EWF’s founder, Loretta Neff. Tickets are $20 and must be reserved through the Kravis Center box office or by going online at Kravis.org. Bombas was founded in 2013 by Randy Goldberg and David Heath. The two launched the company after seeing a Facebook post that mentioned the need for socks at homeless shelters. They adopted the one-for-one business model where the company would donate one pair of socks for each one purchased. Socks for purchase offer several engineered solutions for common sock problems such as the honeycomb arch support and blister tab. Socks donated to the homeless have an anti-microbial treatment and reinforced seams. As of May 2018, the company has donated more than 8.6 million pairs of socks. EW Foundation (EWF) is a 501(c)(3) educational nonprofit organization providing award-winning character education books and literacy programs for children and youth, with emphasis on low-income communities. 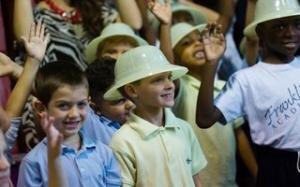 Since 2014, EWF has benefited 33 academies and schools, 50 charities and 17,003 children.